The internal 3.5 "6x All-in-One AXAGON CRI-X6 extends the desktop PC by reading and writing all of the standard microSD / SDHC, SD / SDHC / SDXC, M2, MS / MS Duo, CF, xD memory cards without the need for an adapter. it can be transferred quickly between cards in different slots of the reader. The USB 2.0 port on the front of the reader allows you to connect any USB accessory. all common memory card formats. 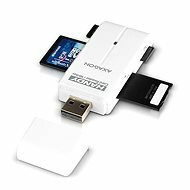 The device supports all kinds of cards, such as Secure Digital and microSD, Memory Stick and MS Micro, Compact Flash and xD Picture Card. The simple clean front panel of the reader does not have a logo and is will fit any design of a PC case. One green LED indicates if a card is inserted correctly by continuous light. When it is flashing, the LED indicates a data transfer. The LED does not operate when there is no inserted card. 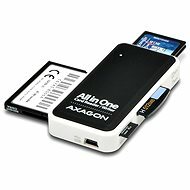 Six slots of this all-in-one reader directly support all common memory card formats micro SD/SDHC, SD/SDHC/SDXC, MMC, M2, MS/MS Duo, CF, xD without the need for an adapter (micro SDXC with an adapter). Fast and convenient - your data can be transferred directly between cards in different slots of the reader (except between MS and M2 slots). 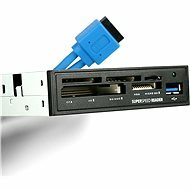 One USB 2.0 port is in the front of the reader and allows the possibility to conveniently connect any USB accessory. The high-quality metal case guarantees trouble-free operation without any electromagnetic disturbance. The device features also a fixed USB 2.0 cable with internal 9/10-pin connector, which enables connecting the reader to most motherboards. In addition, the device is installed automatically, so it can be handled by a complete layman. The needed drivers are included in operating systems and installed completely automatically. The reader directly supports the latest specifications of CF 5.0 (UDMA 0 - UDMA 6), SD 3.0 (SDXC, up to 2TB), SD 2.0 (SDHC, up to 32GB), MMC 4.4 (8-bit), MS 1.43, MS Pro 1.05, MS Pro HG 1.03, MS XC 1.0 (up to 2TB), xD 1.2. The device also supports direct data transfer between cards in different slots of the reader (MS + M2 shares the same bus - no data can be directly copied between them - five memory icon are displayed in the device manager). Supports file formats: FAT 12/16/32, NTFS, exFAT (FAT 64). Fully compatible with USB 2.0 and backward compatible with USB 1.1. Supports transfer speeds of 12/480Mbit/sec (full/high speed). Full Plug and Play support, Hot Plug and Hot Swap. Connect the reader to an internal 10-pin (2x5-pin) USB motherboard connector. Power supply via a USB bus (bus-power). Reader body depth: 95mm, height and width: fitting to the 3.5" position. Weight: 177g (including a USB cable). MS Windows XP/Vista/7/8/8.1/10 and later, Windows Server 2003/2008/2012 and later (supported by all 32- and 64-bit versions of Windows), Mac OS X 10.x and higher, Linux with kernel 2.6.x and higher. Note: Drivers are included in supported operating systems and install completely automatically. No other drivers need to be installed and are not available. An internal reader with a black front and integrated USB cable with a length of 60cm, mounting screws. , Compact Flash, Memory stick, XD Done! For shipping to other EU countries visit this page AXAGON CRI-X6. Für Versand nach Deutschland, besuchen Sie bitte Axago CRI-X6. Chcete doručit zboží do Česka? Prohlédněte si AXAGON CRI-X6. Chcete doručiť tovar na Slovensko? Prezrite si AXAGON CRI-X6. Für Versand nach Österreich, besuchen Sie bitte Axago CRI-X6. Magyarországra történő kiszállításért tekintse meg ezt a termékoldalt: AXAGON CRI-X6.